I a very happy to tell you all that as of today we are pump free! We no longer have water in the basement and the sump hole has remained dry for 24+ hours. Last week we started experimenting with using our septic system again and I can't tell you how enjoyable it is to use our own toilets, take hot showers, do laundry, and wash the dishes without needing to heat pots of water. It's been a long 7 weeks. We are now moving in to clean up mode, which is hampered by the fact that our farm work is at it's height of the season. Baby steps I guess. We'll be put back together eventually. The head cabbage were finally developed enough to harvest some for the CSA today. This is a new crop variety for us and I think they are beautiful. We've tried growing head cabbage before without much success. This year we tried again, but had enough space to plant them in greenhouses. One of the challenges with growing head cabbage organically is the bugs (caterpillars, grasshoppers, ear wigs, and some kind of root maggot looking things). Bugs love to crawl all over the cabbages and eat their way inwards through the layers. It's disheartening to see the damage they can do in so little time, especially after waiting so long for the heads to form. Fortunately, the bugs are keeping away from the cabbage this year (mostly). We didn't see alot of damage to outside leaves, and even cut open a few heads just to make sure. We try hard to look over all our produce and sort out anything that has the potential for a buggy suprise. Such a treat to have baby carrots this time of year. These were grown in greenhouse 6. They are so sweet. I can't promise you'll have carrots every week from here on out, but you will be receivng a steady delivery of carrots from here through the end of the season. Enjoy! Also new in this week's share are the garlic scapes. They are about 2 weeks late this year. Not having them at the first of July was a very obvious reminder of how far behind many crops are this season. I've written about garlic scapes many times in my newsletters from previous years. If garlic scapes are new to you, please use the search option on our blog to access my previous explanations and photos. We also have some recipes posted on how to use the scapes. If you can't use them now, they can be chopped up and frozen. Here is a new recipe idea I was given at the farmers market this past weekend. It sounds very good. Cut the tender curly part of the stalk (not using the blossom end) into 1 inch pieces. Saute the pieces (I'm thinking in extra virgin olive oil) until tender. Remove from heat and serve immediately with a generous sprinkling of pine nuts. 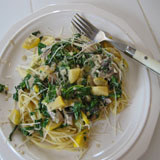 I was also reminded to share a favorite recipe for using the kale (or other left over greens). It's a hearty soup recipe called Ribolitta. We used our spinach this week to make a knock-off restaurant style spinach artichoke dip (there are many recipe versions on the internet). It's not healthy, but we double up on the spinach to ease our guilt a little. Nevermind, I have no guilt eating spinach artichoke dip. Shain wondered today if people would be overwhelmed with the amount of greens in their share this week. (He tries hard to grow a variety of food that you will enjoy eating.) I reminded him that the "greens" are just about all that is ready to harvest right now and that this is the ultimate consumer experience of "eating in season". We hope you will enjoy these weeks of the season while the greens are so nice (and mostly bug free). August will likely bring us into another season (hopefully) when the crops needing warmer weather will be ready to harvest. Shain tells me he saw a few baby squash and zucchini last night. Apparently they really like their new home in the greenhouses. Bok Choy - last of the season. Many of the plants were bolting and getting eaten by bugs. We pulled up the last of the row and salvaged what we could for this week's shares. Thank you for the support and appreciation that has been expressed to us these past few weeks. We recevied many kind words by email and in person letting us know how much we are appreciated, how great the food has been, concern for our flood situation, and even encouragment to take a break from farm work over the 4th of July holiday. Thank you! We are still experiencing some flooding in our home. About 2 weeks ago we reached maximum water flow which required 5 pumps running full time to keep the water level in the basement around an inch or two in. Shain estimates we were pumpong out 15,000 gallons of water per hour then. Today we are down to using only the 1 largest pump and there are even some dry patches on the basement floor. Looks like we are on the down hill side of this experience. It's been a long month. 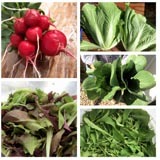 July is typically a slower month of food production for our farm. We've nearly harvested all the early season, cool weather crops and are moving into harvesting warmer weather veggies that were planted outside or later in greenhouses. The amount of produce that is ready to harvest during this transition period is highly dependent on the weather we got in May and early June, which unfortunately, was cool and wet this year. This is why greenhouses are so essential to our operation. Our new greenhouse is letting us have great kale and Swiss chard this week, free of any damage from heavy rains or hail (and not too many bugs getting at it either). This greenhouse will also help us have carrots and beets much earlier to our CSA members. We don't anticipate too much of a decline in the size of our July shares, many crops are getting close. Looking around the farm, Shain says the food will really start coming on in August and September.